This past Spring I had my iPhone stolen while picking up a to-go order at a local restaurant. Because I was under contract I ended up paying a hefty price tag for my new iPhone. It was crazy expensive. Now I am watching this phone like a hawk and trying to protect it from anything I can. What’s the worst thing that can happen to your phone? WATER. How can I protect my brand, spanking new iPhone 6s Plus from water? With a waterproof case! And yes, they really do work. 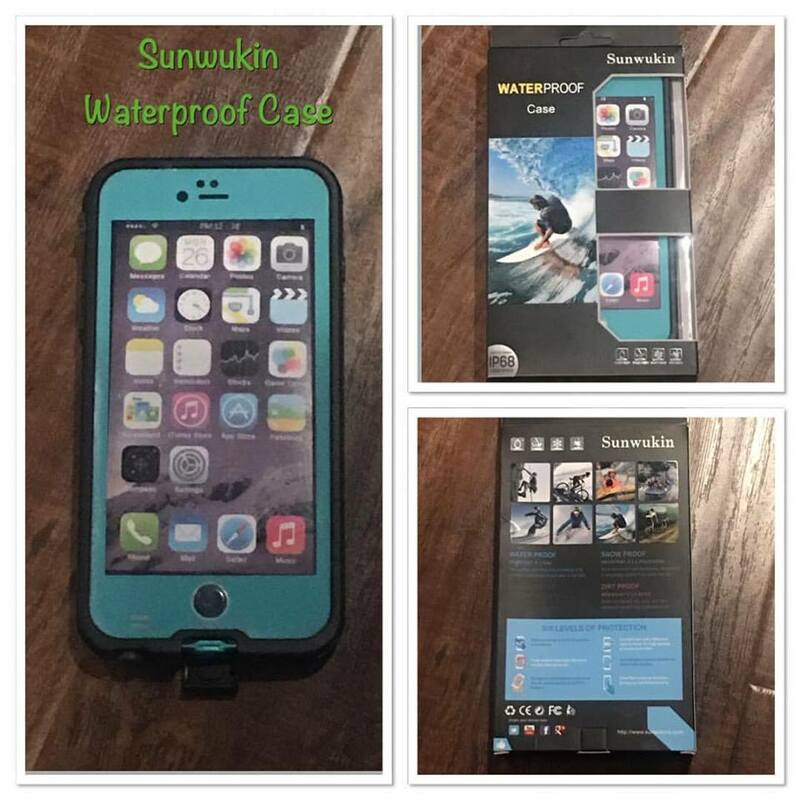 The Sunwukin waterproof case has been protecting my new phone for a while now and it has been a phone saver more than once. Picture this – It’s a hot day and the temps are becoming unbearable. I’m sitting at my desk, trying to block out the uncomfortable heat, phone nearby and a tall glass of ice water nearby too. Well, it’s so hot that the glass of water is sweating, soon there’s a puddle of water around the glass and your phone. (this really did happen) If I would have had a standard case on my phone it could’ve been ruined. But I had the waterproof case on it. So all I had to do was pick up my phone and wipe off the case. The water never touched my phone! This weekend we are going camping. It never fails to rain while we camp. NEVER. But there’s also this amazing beach nearby. I know we are going to want to go and hang out by the water. And because I don’t have a watch my phone will be coming with us. With the waterproof case I know my phone is protected. Protected from any possible water action and also from the sand. While it is wonderful there are a few differences you need to be aware of. Your whole phone is sealed inside this case. That means – Your screen has a protector over it. If you are planning on using your fingerprint to lock the phone it may not work. I just use a passcode. I have never had an issue with the phone recognizing my touch but I do think a fingerprint scan may have an issue or two. All your buttons are covered. For me, I love this! No more little fingers messing with my volume settings or turning the phone on vibrate when I think it’s on sound. And you may need to turn the volume up to hear while you are talking on the phone. Remember, the phone is enclosed. There are no wholes or gaps. You can’t have total protection without making a few adjustments. I’m very happy with the Sunwukin Waterproof phone case. It has already saved my phone from a water mishap. And I’m sure it’ll save it from many more!